Map of Cercanías Murcia/Alicante with tariff zones. Cercanías Murcia/Alicante (Valencian: Rodalia de Múrcia/Alacant) is a commuter rail service (cercanías) in the provinces of Alicante and Murcia. The line connects Alicante and Murcia with San Vicente del Raspeig, Elche, Orihuela, Totana, Lorca, and Águilas. It runs through 200 km of railways with a total of 26 stations. The cercanías consists of three lines. 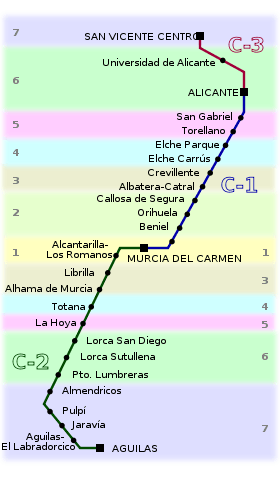 Line C-1 connects Alicante and Murcia by 1 or 2 trains per hour. Line C-2 connects Murcia and Águilas. Line C-3 connects Alicante and San Vicente del Raspeig with about eight trains per day. The railroad linking the cities of Alicante and Murcia was built in 1885. It passes Elche through a tunnel of 5.5 km in length, which was built in 1960s and includes 2 underground stops Elche-Carrús/Elx-Carrús and Elche-Parque/Elx-Parc. The average travel time between Alicante and Murcia is 1 hour and 20 minutes. Since June 15, 2008 trains no longer stop at Beniaján, Torreagüera, and Los Ramos-Alquerías. One train per hour circulates on line C-2 between Murcia and Lorca, with only three daily trains running to Águilas. The average travel time between Murcia and Lorca is 50 minutes and 1 hour 50 minutes between Murcia and Águilas. The railroad between Madrid and Alicante was built in the nineteenth century, but it has not been used for local traffic until 2007 when line C-3 was opened. The line is 8 km long and it takes about 12 minutes to get from Alicante to San Vicente del Raspeig. This article is issued from Wikipedia - version of the 10/28/2013. The text is available under the Creative Commons Attribution/Share Alike but additional terms may apply for the media files.